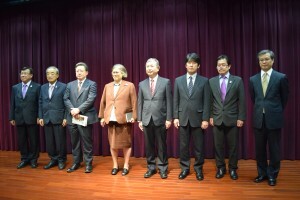 On April 22, 2015, Her Royal Highness Princess Maha Chakri Sirindhorn from the Kingdom of Thailand visited us, accompanied by His Excellency Mr. Sihasak Phuangketkeow (Ambassador of Thailand to Japan) and a delegation of about 50 officials and academics. Her Royal Highness met with the President Makoto Gonokami of the University of Tokyo before arriving at the School of Science and being greeted by Dean Hiroo Fukuda and four students from Thailand. The visitors listened to an introduction of the School of Science given by Prof. Kaoru Yamanouchi (Vice Dean, Head of International Liaison Office) and a presentation on the newly established Vidyasirimedhi Institute given by its Chair, Dr. Pailin Chuchottaworn (President and Chief Executive Officer of PTT Public Co., Ltd.). The visitors then went onto a lab tour to visit three laboratories in the Department of Chemistry (Bioorganic Chemistry, Synthetic Organic Chemistry, and Laser Chemistry).